Did you have a happy Thanksgiving? Ours was pretty low-key. I bucked tradition and made a pork roast and apple spice cake (thanks Giada!). Then on Friday, we did a little shopping at Cedarburg Toy Company, the gardening shop Weeds, and Material Matters for beautiful quilting fabrics in Cedarburg. So now, with a few gifts ready for wrapping, I thought I'd experiment with some hand stamped paper. I love chevron stripes, but I wonder if they're a little too trendy for home decor use. What do you think? 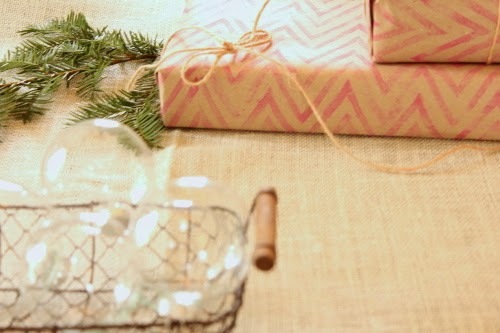 Gift wrapping seems like the perfect place to get my zig zag fix, though. 2) A rubbery carving block like Utrecht Easy cut. I used a 4x6 inch block, which is under $3. They also have a 3x4 inch for around $1.50. 3) A lino cutter (like Speedball's). You only need a V-shaped blade and handle. You could also try an X-acto knife if you have one. 3) An ink pad. I used dark and light pink ink. White didn't work so well for me this time. but that's because the ink's getting a little dried out. 4) A print out of my template down below. Print out the template and draw inside the white lines with pencil. Turn the template face down onto the rubber block and rub over the back of the paper with the rounded dull tip of your linoleum cutter. You can also use the back of a spoon. Pull off the paper. 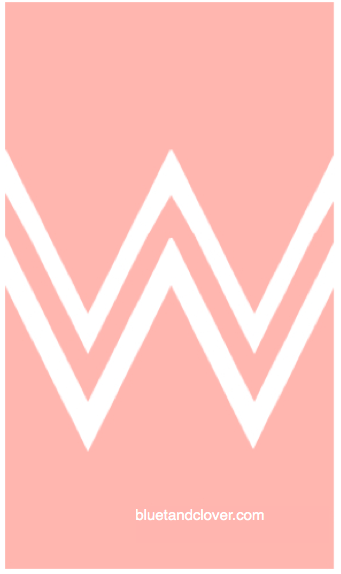 Your pencil markings should have transferred clearly onto the rubber so that you have something that looks like two W's on top of each other. Carve off all the rubber around your pencil markings. 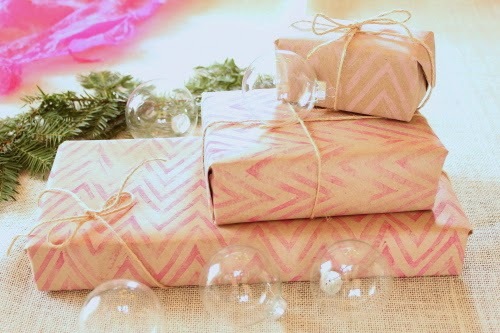 Ink up your stamp and start stamping across the kraft paper and soon enough you'll have some lovely chevron striped gift wrapping paper. You'll have the trendiest presents in town!